LA fiends! 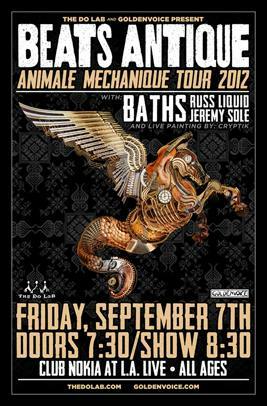 You can win tickets to The Do Lab’s Beats Antique and Baths show at Club Nokia this Friday, September 7th. All you have to do is “like” the Ultra Vulgar Super Fiend facebook page and send an email to contests@theconfluencegroup.com with “Ultra Vulgar & Beats Antique” in the subject and you and a friend will be on your way to see the west coast champions of world infused rhythms, Beats Antique, live at Club Nokia!